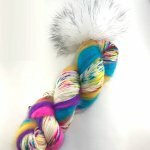 When it comes to yarn, knitters are like kids in a candy store. We want it all and we want it now. The Sweet Shop by Stephanie Lotven was specifically designed for those thrilling colors that you cannot imagine putting back on the shelf. 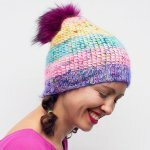 Knit in the round from the bottom up, this slouchy hat is great for beginners and expert knitters alike. The stretchy stitch pattern is fun to knit and extremely forgiving for knitters who don’t like stressing over gauge.